My orchidarium and some of the orchids I've bloomed. 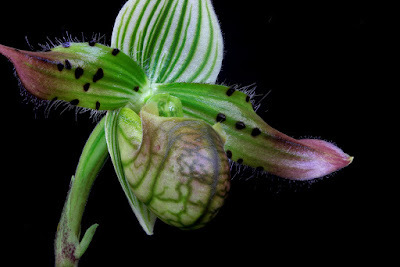 Paphiopedilum sukhakulii is a species from Thailand. It is a small plant but has large and dramatic flowers. My plant almost always blooms with two flowers per stem, rather than just one. The flowers are 10-13 cm across. Not only are the flowers beautiful, however, but the plant is too, with beautifully patterned fans of leaves as can be seen in some of the photos. Dendrobium leucocyanum is a miniature species from high altitude montane forests in New Guinea. It is cool to cold growing and produced clusters of pale blue flowers in late winter. 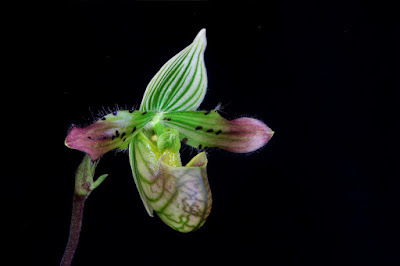 The flowers are 0.4cm long and do not open very widely. The pseudobulbs with their leaves are 2-3cm tall. The plant blooms on the older leafless pseudobulbs. This is the second time I've had it bloom but this time with only two flowers. I may have to try slightly lower light. This plant is tiny! The rosette of leaves, which is itself rather unusual, is only 4 cm across and the tiny flowers are 5 mm long. The flowers bloom three or four to a spike and bloom successively in the spring. 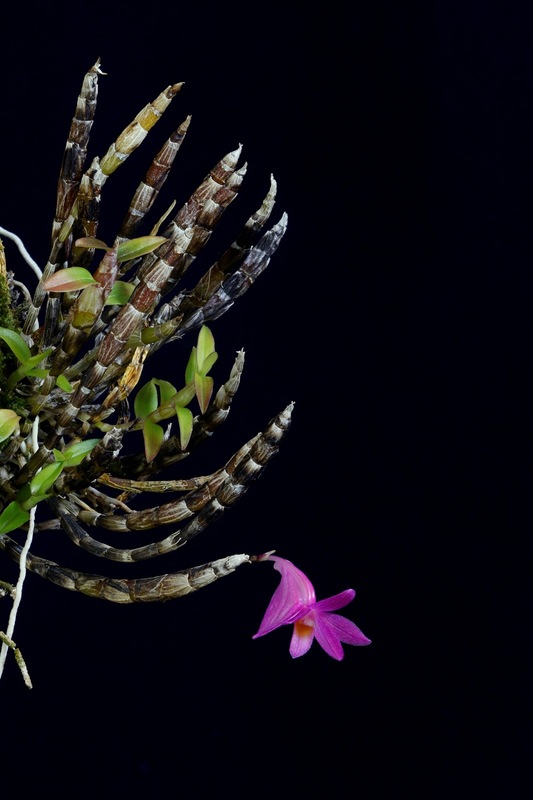 The species is from Argentina and Brazil and is named after a famous naturalist and orchid collector, Charles H. Lankester. Porroglossum is a genus of miniature orchids all of which have spring-loaded moveable, insect-trapping lips. When the flower is disturbed by a visiting insect, the lip springs up trapping the insect against the column and hopefully effecting pollination. 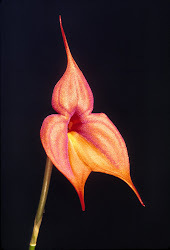 The genus is related to Masdevallia and includes about 50 species. In these photos the flowers all have their insect-trapping lips in the open position, except for the flower in the last photo. 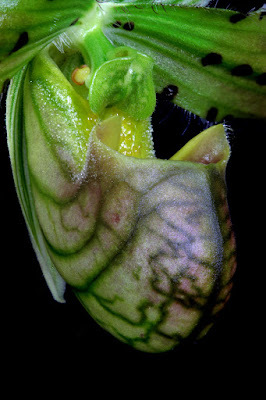 The plant is difficult to photograph with the lips open because the slightest disturbance cause the lips to snap shot. The flowers are 1.5 cm on 6-8 flower spikes on a 3 cm plant. 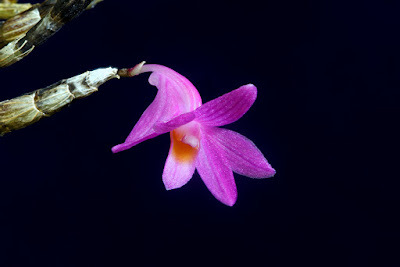 This small plant is Porroglossum tripollex from Ecuador. I have two of these, one with brown "tails" and this with yellow. The flower looks to me like a bird's beak, but tripollex means "three thumbs," a resemblance I do not see. It is cool to cold growing and comes from montane forests. 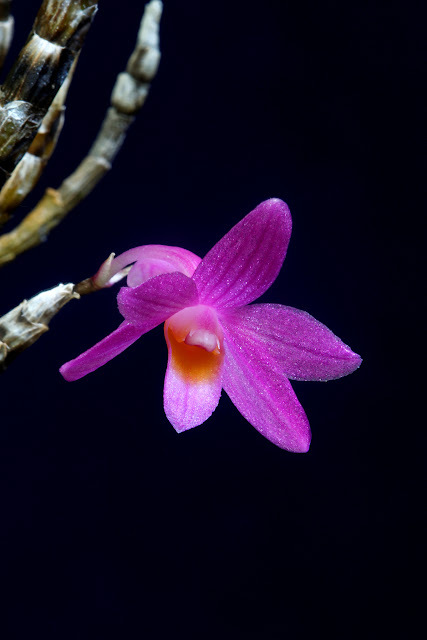 Dendrobium hasseltii is a variable species both in plant size and flower color. 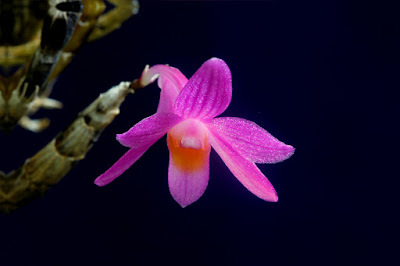 My plant is very small, only 8 cm, and the 2 cm flowers have very good color. I've found the plant difficult to bloom and this is only the second flower I've had on it. It requires cool to cold temperatures and I am providing that, but learned recently that it likes to be dried out a bit in the winter, so I'll have to do that and see if it produces more flowers then. Trisetella regia is, relatively speaking, the giant of the genus, and well-named regia or "regal." Most of the plants in the genus are tiny, only a few centimeters tall, with small flowers (1.5-2 cm) on short flower spikes. This species is 7 cm tall with long 20 cm flower spikes and 4 cm flowers. 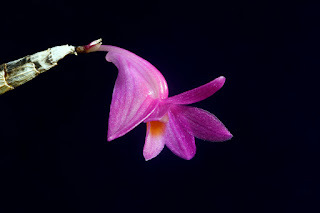 The flowers are typical in shape and color for the genus and have the long "tails" for which the genus is named. 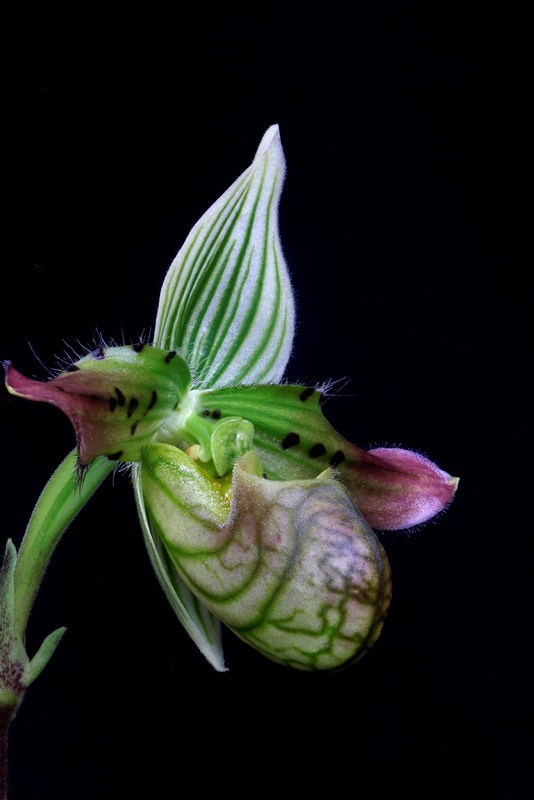 Their obvious resemblance to Masdevallias had them classified as Masdevallias at one time. Sometimes referred to as the "Brain Pouch Paphiopedilum" for obvious reasons, the Slipper Orchid is from Bangladesh, Bhutan, China, India and Nepal. 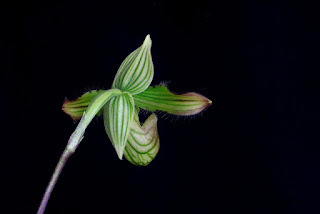 It is also desirable for its beautiful foliage, a rather uncommon feature in orchids. The flowers are not large but it is easy to grow and blooms faithfully on every new growth. My plant is grown on a windowsill in moderate light and in a bark mix.